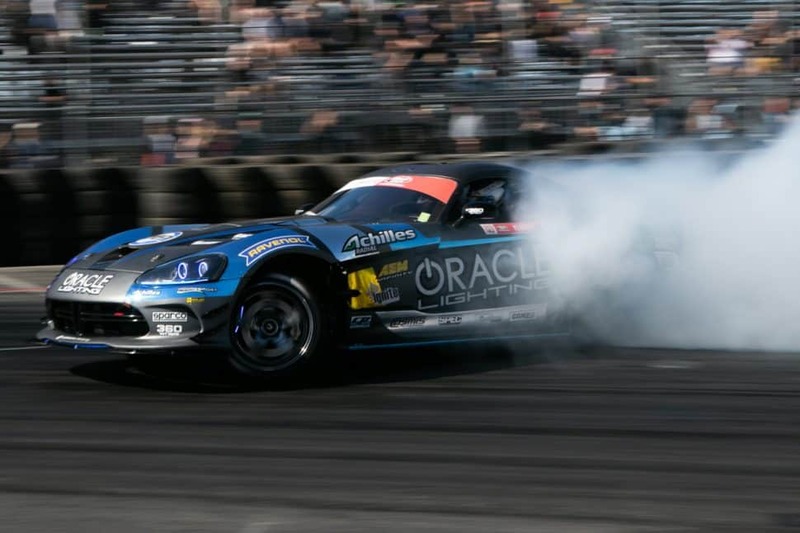 Dean Kearny in the Oracle dodge viper during the Formula DRIFT in Long Beach, Saturday, April 6, 2019. Photo by Jose Cardon. 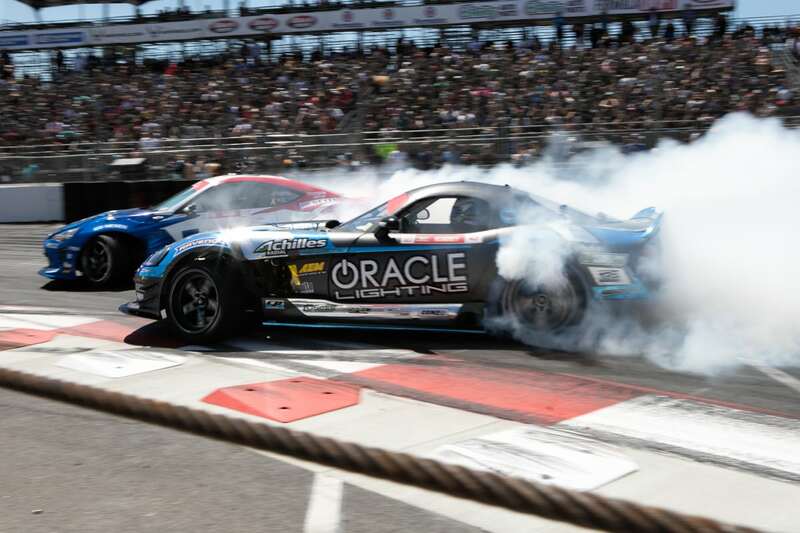 Formula Drift returned to the streets of Long Beach for the 14th year to kick off the 2019 season. The two-day event started with 36 cars and drivers fighting to qualify for the top 32 to spots and drive their way down the charts to the top 16, eight and four, and ending with the top two cars battling it out for this weekend’s first place podium. Formula Drift made its debut in Long Beach in 2005 and has been a staple and an unofficial kick off to IndyCar weekend that follows. Fans were treated to vendor booths—many whom equip cars in the series—along with food, refreshments and beer. On Saturday attendees were treated to a car show behind turn 1 with a wide array of custom cars and their builders. 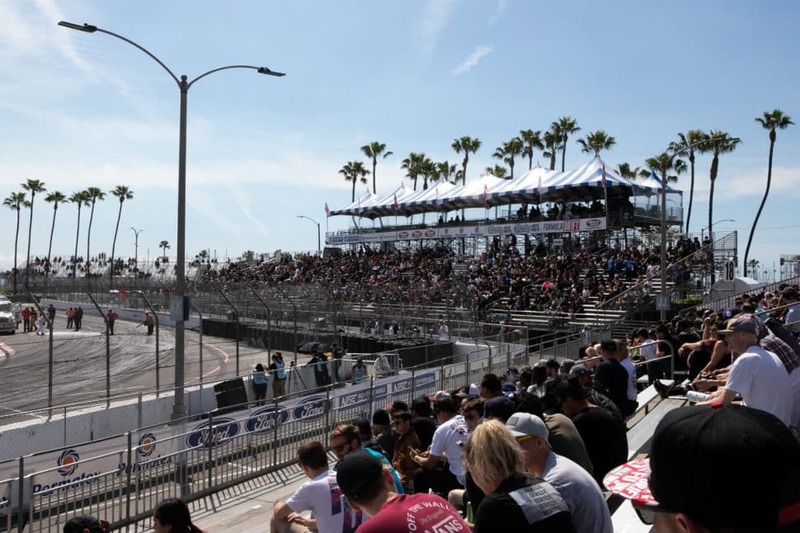 On the track, every run during practice, qualifying and competition had fans on their toes as competitors made their start from Seaside Way onto turn 1 into the Long Beach Convention Center parking lot, hitting speeds of up to 100 mph. The cars turned sideways, burned rubber and created huge clouds of smoke. The Nissan-powered cars ruled the streets, taking all three spots at the podium. This year’s winner was Lithuanian driver Aurimas Bakchis, who powered his Nissan through the grid of the top 32. Second place was American driver Forest Wang, and third place winner was fan favorite Chirs Forsberg in his Nissan 370Z. 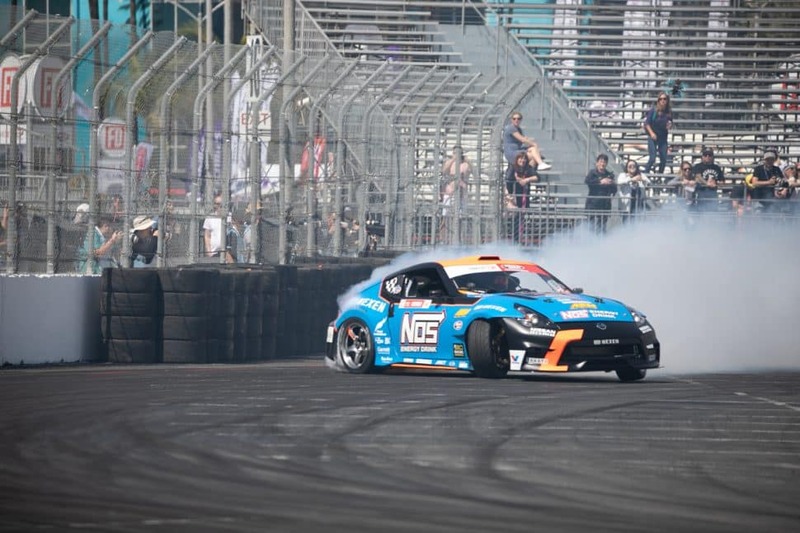 Sebastian Guthier turning into the famous hairpin turn during the Formula DRIFT in Long Beach, Saturday, April 6, 2019. Photo by Jose Cardon. 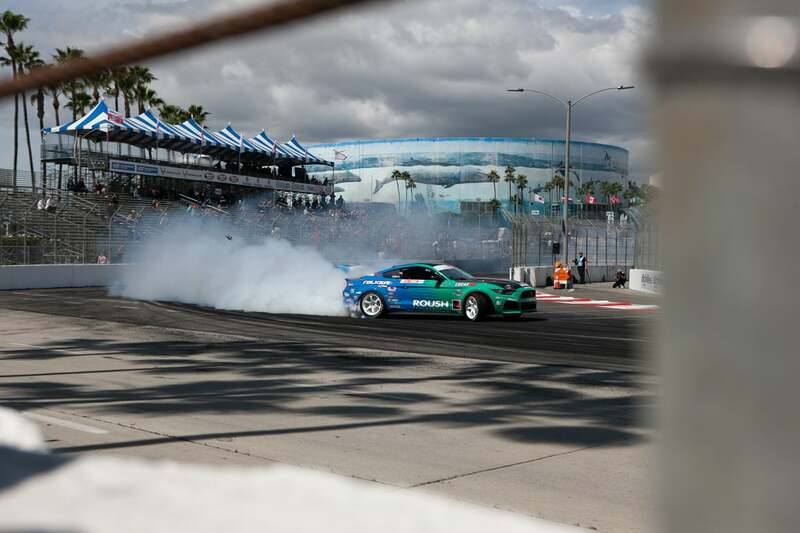 Justin Pawlak fan favorite in the Roush Mustang during the Formula DRIFT in Long Beach, Saturday, April 6, 2019. Photo by Jose Cardon. Jhonnattan Castro and a beautiful downtown background during the Formula DRIFT in Long Beach, Saturday, April 6, 2019. Photo by Jose Cardon. Chris Forsberg NOS energy drink driver. Nissan 370z during the Formula DRIFT in Long Beach, Saturday, April 6, 2019. Photo by Jose Cardon. 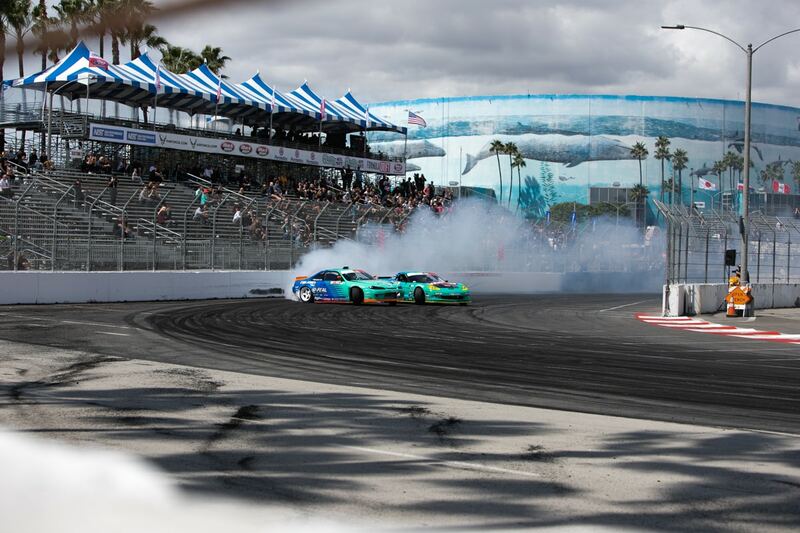 Two of the driver come around a turn during a practice run during the Formula DRIFT in Long Beach, Saturday, April 6, 2019. Photo by Jose Cardon. 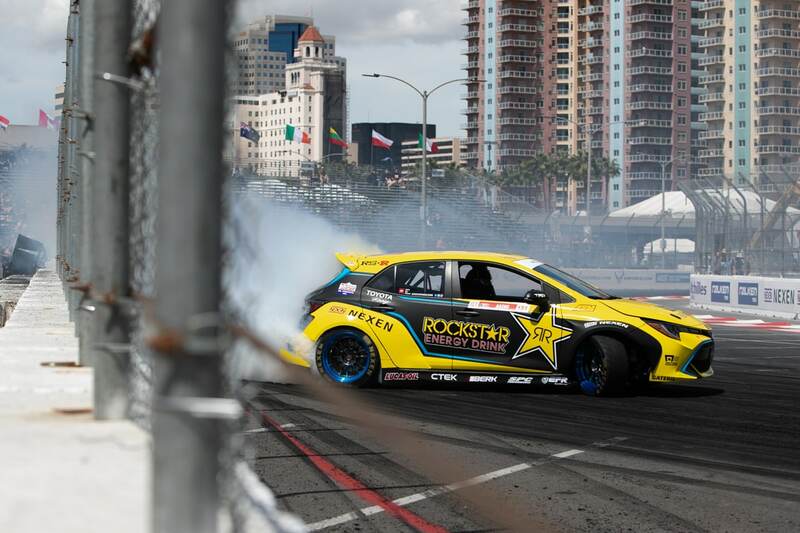 A fan favorite Frederic Aasbo in the Rockstar Energy Toyota Corolla up close and personal with the barrier during the Formula DRIFT in Long Beach, Saturday, April 6, 2019. Photo by Jose Cardon. 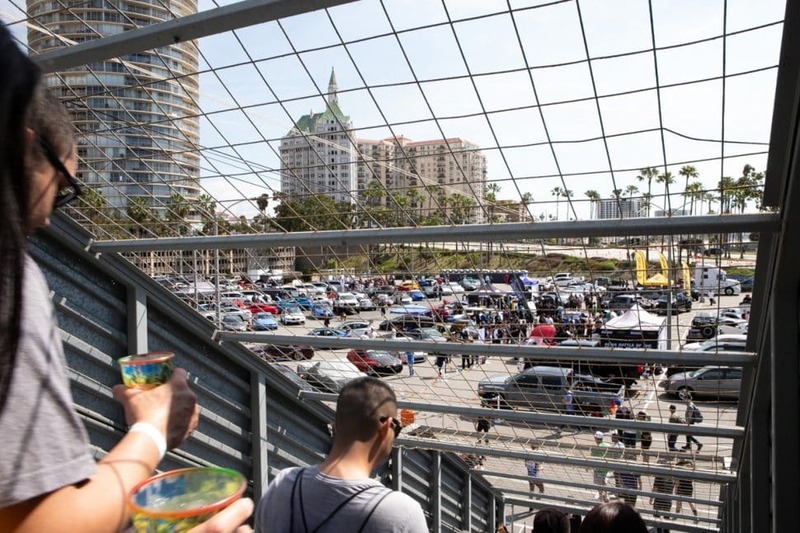 Fans enjoying Saturday’s car show during the Formula DRIFT in Long Beach, Saturday, April 6, 2019. Photo by Jose Cardon. Fans crossing the bridge and headed to the car show during the Formula DRIFT in Long Beach, Saturday, April 6, 2019. Photo by Jose Cardon. By noon fans started to fill the grandstands during the Formula DRIFT in Long Beach, Saturday, April 6, 2019. Photo by Jose Cardon. 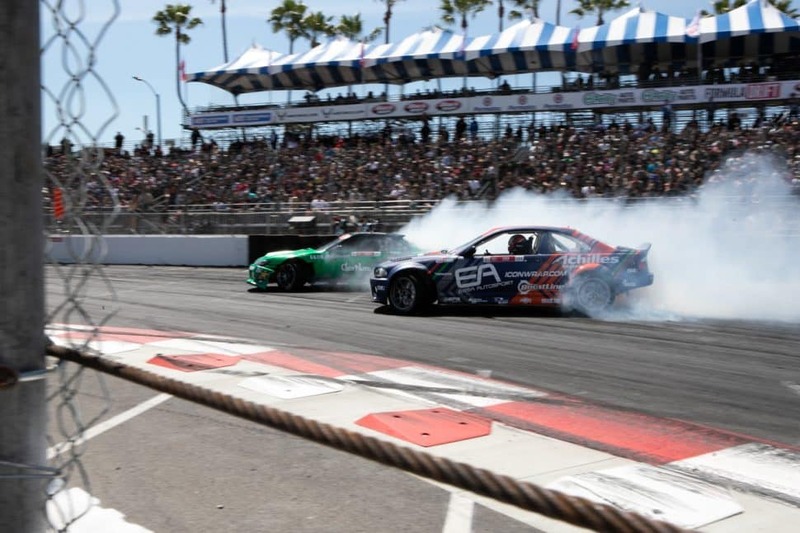 Michael Essa driving the EA sports BMW battling Mitch Larner’s get nuts Nissan Sylvia during qualifying during the Formula DRIFT in Long Beach, Saturday, April 6, 2019. Photo by Jose Cardon. 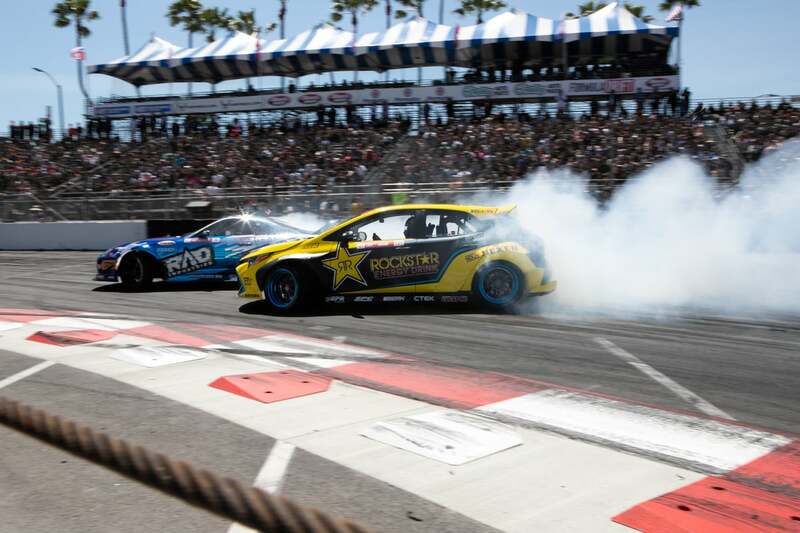 Battle between series favorite Frederic Aasbo in the yellow Toyota Corolla chasing Dan Burke in the RAD industries Toyota Supra during the Formula DRIFT in Long Beach, Saturday, April 6, 2019. Photo by Jose Cardon. 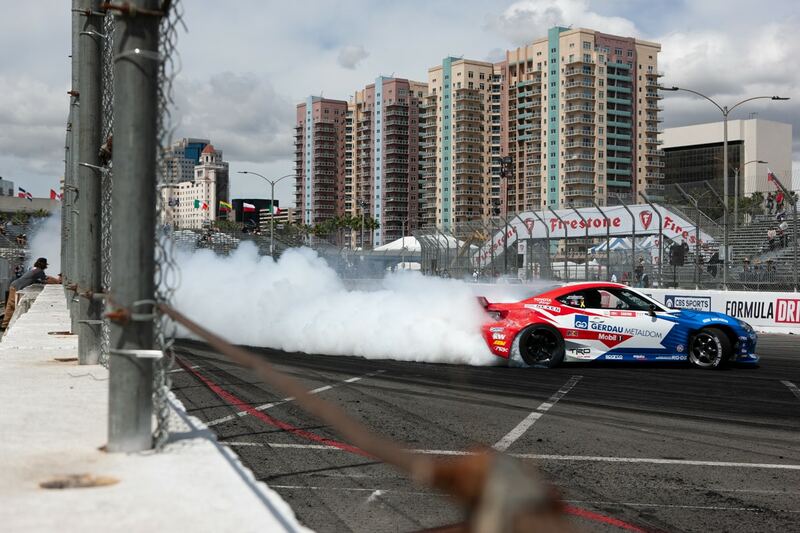 Dean Kearny in a Dodge Viper during the Formula DRIFT in Long Beach, Saturday, April 6, 2019. Photo by Jose Cardon. Driver Ryan Tuerck shoots straight into the wall after losing control on turn 2 during qualifying during the Formula DRIFT in Long Beach, Saturday, April 6, 2019. Photo by Jose Cardon. 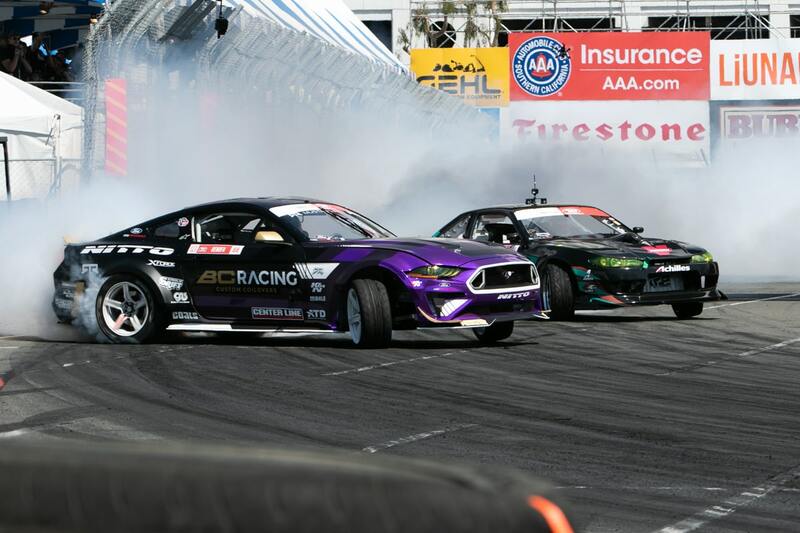 Monster energy car driver Vaughn Gitting Jr., left, in his Ford Mustang during the Formula DRIFT in Long Beach, Saturday, April 6, 2019. Photo by Jose Cardon. 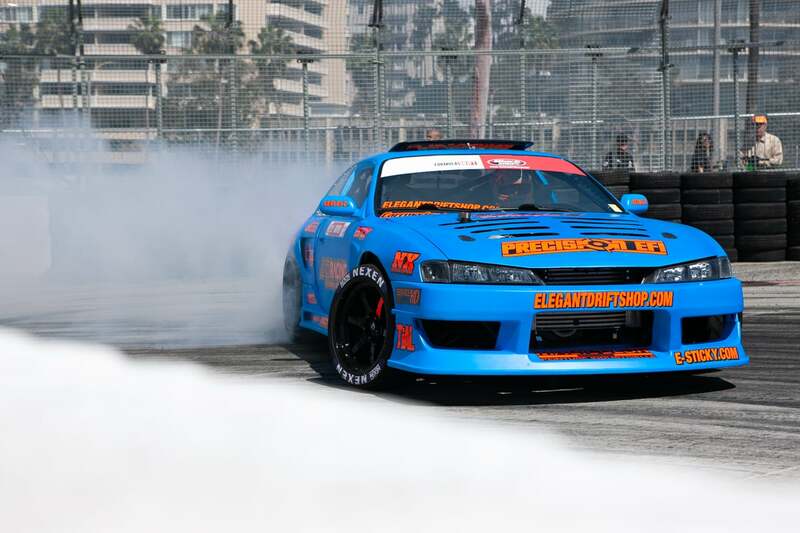 Sebastian Gauthier rookie driver, right, in his blue Nissan Sylvia during the Formula DRIFT in Long Beach, Saturday, April 6, 2019. Photo by Jose Cardon.